Dave Grant was born in 1942 in Tennessee. He entered the Air Force through Officer Training School at Lackland AFB, Texas, on February 18, 1966, and was commissioned a 2d Lt on May 17, 1966. Lt Grant next completed Undergraduate Pilot Training and was awarded his pilot wings at Laredo AFB, Texas, in August 1967, and then completed F-4 Phantom II Combat Crew Training before serving with the 80th and then the 35th Tactical Fighter Squadron (TFS) at Yokota AB, Japan, from April 1968 to November 1969. 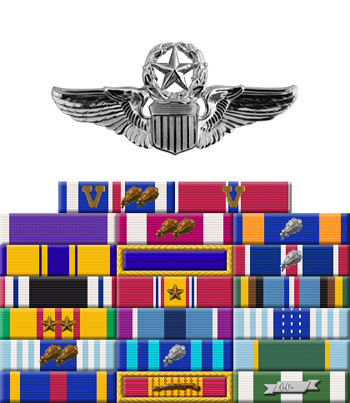 He served with the 46th TFS at MacDill AFB, Florida, from December 1969 to August 1970, followed by service with the 523rd TFS at Clark AB in the Philippines from August 1970 to February 1972. His next assignment was flying combat missions with the 421st TFS out of DaNang Airfield in the Republic of Vietnam from March until June 24, 1972, when he was forced to eject over North Vietnam while flying his 75th combat mission. After spending 278 days in captivity, Capt Grant was released during Operation Homecoming on March 28, 1973. 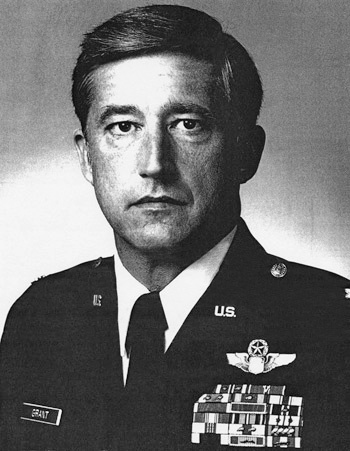 He was briefly hospitalized to recover from his injuries and then returned to flying status with the 59th TFS at Eglin AFB, Florida, where he served from September 1973 to May 1974, followed by service as Assistant Chief of Stan Eval for the 33rd Tactical Fighter Wing at Eglin from May 1974 to August 1975. Maj Grant next served as a Joint Chief of Staff/Chief of Staff Air Force Tactical Deployments Manager on the Tactical Air Combat Operations Staff at Langley AFB, Virginia, from August 1975 to November 1978, and then served with the 347th Tactical Fighter Wing at Moody AFB, Georgia, from November 1978 to August 1981. His next assignment was on the staff of U.S. Air Forces in Europe at Ramstein AB, West Germany, from September 1981 to August 1984, followed by service on the staff of 9th Air Force at Shaw AFB, South Carolina, from August 1984 to February 1988. Col Grant's final assignment was as Assistant Director of Operations and Chief of Combat Operations with the Tactical Air Control Center at Shaw AFB from February 1988 until his retirement from the Air Force on April 1, 1994. Captain David B. Grant distinguished himself by heroism while participating in aerial flight ever Southeast Asia on 24 June 1972. On that date, Captain Grant attacked a hostile aircraft interceptor and forced the interceptor to disengage an attack on his flight lead. Despite extremely heavy and accurate antiaircraft fire and surface to air missiles, Captain Grant, with complete disregard for his personal safety, effectively neutralized the attack. The outstanding heroism and selfless devotion to duty displayed by Captain Grant reflect great credit upon himself and the United States Air Force.